Here at Oaklands Inn we pride ourselves on providing guests with the highest quality customer service. 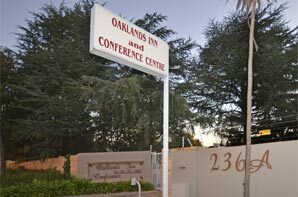 Please feel free to CALL US on 011 781 0862 or drop us an EMAIL at info@oaklandsinn.co.za and we’ll get back to you as soon as we can. How to get here from the airport or by Gautrain. 1. Take the Gautrain to Sandton Station. 2. From Sandton Station take the S4 Gaubus to Randburg. 3. Get off at stop 5 at the corner of Replublic Rd and Bram Fisher Dr.
4. Keep walking in the same direction the bus was travelling to the next road Oak Avenue. Turn left onto Oak Avenue. Oaklands Inn is situated on the right hand side of the road. 236A Oak Avenue, Ferndale, Randburg, Johannesburg, South Africa.